O’Neil Fine Builders’ Topsfield MA home additions provide the extra living space your family is looking for. Jim O’Neil started Fine Builders in 1990 with one goal in mind: quality. To this end, we provide the North Shore with 100% pure craftsmanship you will love. Treating your addition with care and respect, the home addition builders at O’Neil Fine Builders leave your Topsfield MA home just the way you want it. From start to finish, our comprehensive design-build process ensures every aspect of your design specification is accounted for during the construction of your new living space. Schedule an appointment with our home addition builders in Topsfield MA today. Jim O’Neil Fine Builders guarantees quality, courtesy and pure craftsmanship during the building of your addition. 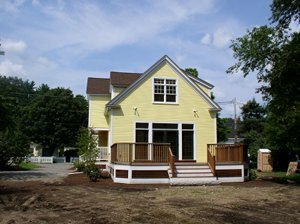 Call 978-927-7711 or use the contact form to get in touch the best home addition builder in Topsfield MA. .